lurring the lines between chef, artist, entrepreneur and inventor, David Burke stands as one of the leading pioneers in American cooking today. His fascination with the art of the meal has fueled a career marked by creativity and critical acclaim. Burke’s mastery of French culinary technique was confirmed when, at age 26, he won France’s coveted Meilleurs Ouvriers de France Diplome d’Honneur for unparalleled skill and creativity with his native cuisine. Additionally, Burke has been honored with Japan’s Nippon Award of Excellence, the Robert Mondavi Award of Excellence and the CIA’s August Escoffier Award. Nation’s Restaurant News named Burke one of the 50 Top R&D Culinarians and Time Out New York honored him as the “Best Culinary Prankster” in 2003. In May 2009, Burke was inducted into the “Who’s Who of Food & Beverage in America” by the James Beard Foundation. In this same month, he also won the distinctive, Menu Masters award from Nation’s Restaurant News as one of the nation’s most celebrated innovators. Star Chefs, the magazine for culinary insiders, awarded Chef Burke with the “Contribution to American Cuisine Award” at the 2009 Star Chefs Congress. Burke trained at the Culinary Institute of America, and soon thereafter, he traveled to France where he spent several stages with notable chefs such as Pierre Troisgros, Georges Blanc and Gaston Lenôtre. Burke returned to the U.S. as a sous chef for Waldy Malouf at La Cremaillere and then for Charlie Palmer at River Café where he ascended to Executive Chef and earned three stars from The New York Times. In 1992, Burke opened the Park Avenue Café with Smith & Wollensky CEO Alan Stillman, and then, in 1996, he became Vice President of Culinary Development for the Smith & Wollensky Restaurant Group. 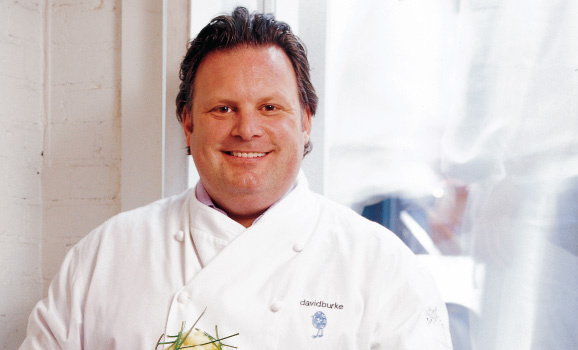 In 2003, Burke opened davidburke & Donatella, now known as David Burke Townhouse, of which now he has sole ownership. Next came David Burke at Bloomingdale’s, a dual concept restaurant offering both a full service “Burke Bar Café” on one side and a “Burke in the Box” take-out and eat-in concept on the other side. Burke also opened up David Burke’s Primehouse in The James Chicago Hotel. Burke’s restaurant collection continued to grow when he purchased Fromagerie, a fine dining restaurant in Rumson, New Jersey where his culinary career began under founders Markus and Hubert Peter. David Burke Prime opened at Foxwoods Casino & Resort in July 2008 and Fishtail by David Burke, opened in December 2008 in New York. During his tenure at the River Café, Burke began experimenting with interesting ingredients and cooking techniques. His first culinary innovations, Pastrami Salmon™ (now available through Perona Farms), and flavored oils revolutionized gastronomic technique. During his twelve year period at the Park Avenue Café, Burke created GourmetPops™, ready-to-serve cocktail lollipops. Never one for slowing down, Burke continued to develop creative culinary products including easy Flavor-Transfer Spice Sheets and Flavorsprays, both designed to eliminate fat while keeping the flavor. Additionally, Burke is actively involved with culinology, an approach to food that blends the culinary arts and food technology. Burke’s first cookbook, Cooking with David Burke was published in 1995, and his second, David Burke’s New American Classics, by Alfred A. Knopf launched in April 2006. 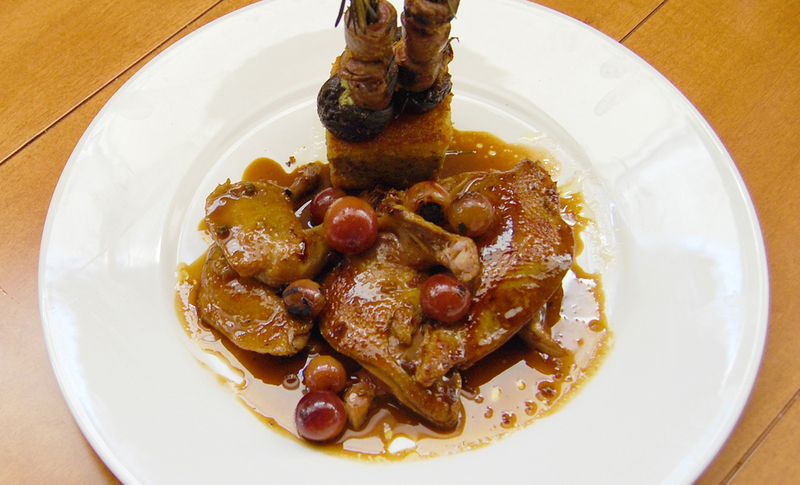 Try this recipe for foie gras corncake sandwiches from Chef David Burke, which he served with pressed squab in our Duck Press Video. 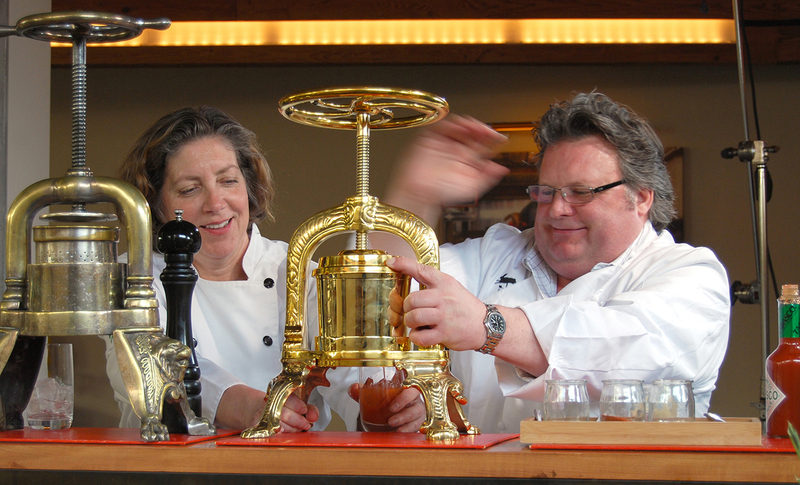 Ariane & Chef David Burke crank up their duck presses to make the classic dish canard à la presse. Then David presses a squab (and even some vegetables! ).